The NO BORDERS CAMP ended with three arrests - what we wanted is simple - a world without borders - what we got was pepper bullets, batons and as always repression. 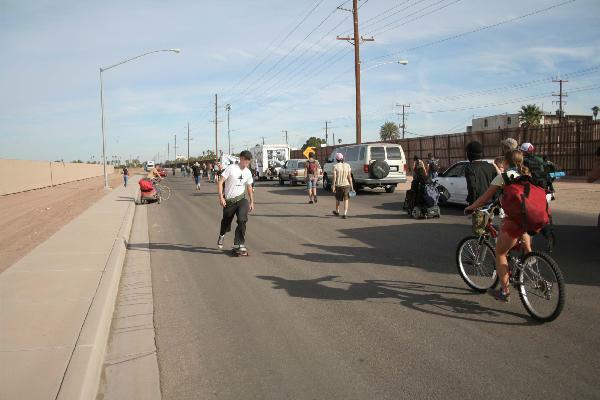 Activists from around the world converge at the No borders Camp in Calexico and Mexicali to say NO to BORDERS. Borders that only cause destruction, borders that kill people that are trying to survive, borders that destroy the environment, and borders that only serve the interest of the rich. Although it was a somewhat peaceful week the MIGRA showed their true colors at the end of our encampment, beating up our compas and arresting three. Please visit the noborderscamp.org website to learn more about this repression and to show solidarity for Juan who is still in prison.